We mentioned switching at the page with mucking. Like mucking, card switching also demands a great coordination of hands from you, as well as practice of course. What is card switching if to be exact? Switching is a replacing of the cards you have. Usually cheaters have their own cards in their sleeves what makes it easier to exchange them when it is needed. That is why it would be better for a casino’s security to check players’ sleeves before the game. Usually this method is chosen by people who are very skillful in sleight of hands. Switching sometimes reminds us the tricks of magicians. All of us are surprised when a magician shows tricks with cards though we understand that is not a magic but just a good hands’ coordination. Certainly, if you bring your own cards with you with a plan to substitute them during a game you must be sure these cards will look perfectly as the casino ones. The cases are that sometimes people bring their handmade cards with them. Be very attentive while reading and looking for the information about switching in blackjack and Blackjack Switch. They are completely different things. 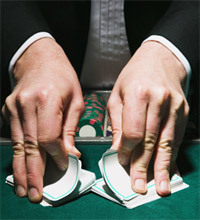 If switching is about cheating at blackjack, Blackjack Switch is a separate game with its own rules. Here a player has two hands of cards and he is allowed to exchange cards between those two hands for choosing the most appropriate variant. Sometimes the decision how it would be better to substitute cards seems to be obvious but there is a separate strategy of Blackjack Switch which helps players to consider all the variants.